It has been a few weeks since the first flight but at this point there has now been a few hours of phase one flight time logged on the RV-12. 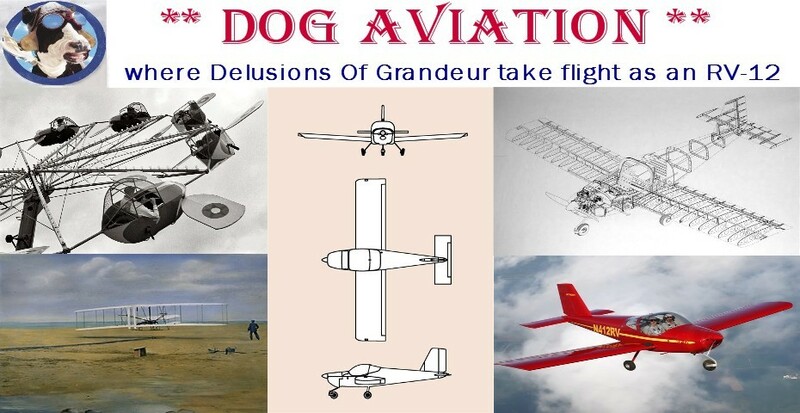 For those non-aviation readers of the DOG Aviation Blog not familiar with the rules for initial flight testing, here is a quick rundown. The FAA imposes a flight testing period called “phase one” testing. The required phase one “fly off” time period will vary depending on the certification type of aircraft. Because the DOG Aviation RV-12 was built and certificated as E-AB (experimental- amateur built), the FAA’s rules dictate the required phase one fly off time be 40 hours. The FAA will assign a flight testing area (this area can be negotiated within reason) for the phase one flight testing. During the phase one flight testing of the aircraft, the pilot must conduct all test flights within the boundaries of the assigned phase one testing area solo … no passengers allowed. After the phase one testing is completed, the shackles are lifted and the airplane is free to fly wherever the pilot desires … also, at this point, passengers can be given rides in the aircraft. Being a “test pilot” is something not to be cavalier about … it needs be taken quite seriously and methodically as confidence in the aircraft is gained all the while slowly expanding the flight parameters. My hope was to have more time on the RV-12 by now, but the weather has not cooperated as much as I had hoped. There have been rainy days, days with very low clouds and days that although sunny, had way much more wind than I felt comfortable with for the first few hours of flight testing. Admittedly, thus far, I’ve been overly conservative on my weather requirements but there is no shame in that … in fact, it is prudent. The RV-12 flies really nice and I'm very pleased with it thus far. But it can be made to fly even better ... in that, there are a couple of minor issues that need to be addressed. Now that I’ve got more hours on the RV-12 and have been up to fast cruse speeds there are two small issues that need addressed. First there is a slightly heavy left wing. It only requires fingertip pressure on the stick to keep the airplane level, but it will not fly level if the finger is removed. Letting go of the stick allows the left wing to slowly drop off from level and the aircraft begins to roll to the left. Having a heavy wing is quite common and for the most part fairly easy to resolve. The solution Van’s suggests trying first is reshaping the aft edge of the flaperon on the LIGHT wing (the right wing in my case). I made a small adjustment a couple of days ago and flew the RV-12 again yesterday and although slightly better it was not enough correction. After landing, I carefully used a pair of seeming pliers to tighten the bend (ever so slightly) on the aft edge of the right flaperon so will see if that was enough. Van’s says it does not take much to get the desired results so I did not get very aggressive. This type of tweaking requires lots of patience … make a small adjustment and go fly … repeat … until satisfied with the results. The other small issue that I knew would be present at cruse speeds is yaw. The right foot needs to constantly apply steady pressure on the right rudder pedal to keep the aircraft flying straight without any yaw. Of course, that gets tiring after a while, so a rudder trim tab will be necessary. Read more about that instillation in the next post. The other issues that were discovered after the first flight appear to be resolved. The oil line that had a smear of oil on the fitting was tightened and is not showing any signs of leakage now. Also the oil that was found dripping from the bottom of cylinder #1’s rocker arm cover was traced back to the exhaust stud during inspection and cleaned off. Now after the after the second flight of well over an hour, is almost cleared up now. After removing the cowl for inspection a slight amount of dark oil was found under the exhaust flange stud for the #1 cylinder as can be seen in the photo below. Using an inspection mirror to view the small dark oil mark coming from cylinder #1’s exhaust pipe flange stud. As can be seen in the above photo, the amount of dark oil is now just a small streak after over an hour of flying. The first flight only lasted fifteen minutes and there was oil all the way under the rocker arm cover and a drip onto the lower cowling. Now after an hour, there is just a small streak of dirty looking oil, so I’m convinced this is either oil left over from the machining process or an anti-seize lube of sorts … my money is on lubricant left over from the machining process working its way out of the thread gallery for the stud. The other unexpected issue discovered a week ago was a small fuel leak coming from the fuel valve on the bottom of the gascolator. At first I thought it was a leak from the valve not sealing correctly ... but upon closer inspection, it was determined the fuel was actually leaking from the threads on the fitting. The fitting was tightened … twice in fact, and although the leak diminished somewhat, it did not stop. The CAV-110 fuel valve can be seen here screwed into the bottom of the gascolator. 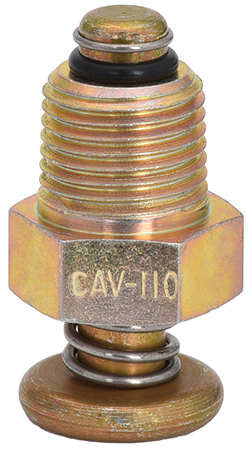 Close-up photo of a CAV-110 fuel drain valve. I ended up deciding on just replacing the CAV-110 fuel valve and also used a different type of thread sealant (TiteSeal) on the threads … seemingly no issues now.